Golden Riviera Casino :: Loose Cannon video slot – PLAY NOW! Ahoy, me hearties! Welcome aboard the good ship Loose Cannon, where a motley crew of peg-legged pirates will steer you through this 5 Reel, 243 Way slot on your way to treasure! Plunder your way through Wild and Scatter Feat ures, and trigger 15 Free Spins that’ll have you feeling more than ship shape. Grab your Captain’s Hat and prepare for rough seas with the Wild Cannon Feature. Featured on Reel 3 in both Base Game and Free Spins, this weighty Wild expands to cover the entire third Reel, and shoots out a volley of cannonfire that can turn up to 15 symbols wild! Raise your bottle of rum when three Compass Scatters land on Reels 1, 3, and 5, as it’s time to fill your treasure chest with 15 Free Spins. With the Wild Cannon feature firing at random, and symbol pays from left to right and right to left, get ready for Port to Starboard wins! With a minimum bet of 0.30, it’s easy to step on board and set sail towards a booty of up to 75 500.00. Raise the Jolly Roger and give a yo ho ho; it’s a pirate’s life for you! 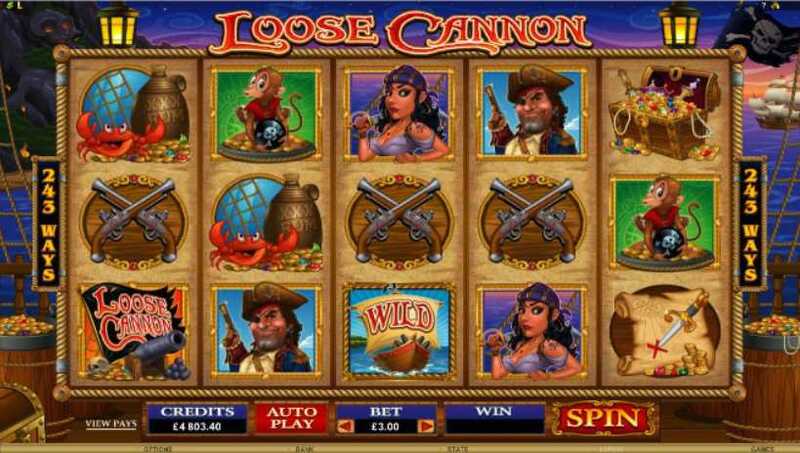 Loose Cannon :: You can try this NEW Slot game right now at the following casinos: All Slots Casino, Red Flush Casino, Jackpot City Casino, Casino UK, Casino Epoca, Casino LaVida, Crazy Vegas Casino, Golden Riviera Casino and Casino-Mate.